We all know there’s no better pain relief than physical contact with someone you love. Whether it be just holding their hand or being enveloped in a hug, it always helps us feel better. When we are hurting it’s just our instinct to search for that physical contact with a loved one to soothe us. Unfortunately, the people we love can’t always be by our sides. Life sometimes prevents us from being able to hug them tightly whenever we want. They could be at work, overseas, or live far away. Could photos of our loved ones help ease whatever is paining us? There’s good news for all those who are missing somebody! Studies have proven that looking at photos of someone you love can help relieve pain as effectively as physical contact. Researchers at the Stanford University School of Medicine scanned the brains of people who are in love. The subjects looked at photos of their partners while varying levels of pain were applied to their palms. The results showed that average pain was relieved up to 44% and intense pain was alleviated by 13%. The study also showed that it doesn’t have to be a photo of a significant other that helps ease pain. Looking at any photo of someone you love will do! The next time you’re wishing you could be hugging that special someone when you’re in pain, just flip through photos of family, pets, and friends and you’ll be feeling relief in no time! It’s the magic power of photos. Now we know for sure that looking a photo of someone in a locket necklace can dull whatever pain you’re going through. Each time you glance at the photo tucked inside the photo locket, you’ll know their love is always close and that you can get through anything. Being a mom is an ever-growing job. With each passing milestone, Moms earn badges right alongside their kids — remember the “I-made-it-through-one-day-without-crying” achievement? And since Mom is always changing, her jewelry style is bound to make a couple of 360’s every once in a while. Now, this certainly doesn’t mean her style is restricted to one category over another. After all, every mom is different. And here’s the perfect way to celebrate that. These moms lean toward simple, appropriate looks for all times of the day. And to avoid unnecessary injury at the hands of an intrigued infant, anything that dangles is definitely out. These moms don’t have much time to decide on wardrobe accents. They’re busy being the loudest cheerleaders and #1 fans. Personalized or family jewelry is perfect for the supportive mother. With the kids a bit older, seasoned moms have a little more time to deliberate on which type of jewelry they’re sporting. They also have more time for those fancy dinner dates and nights out on the town. Try a fancier bracelet or dangle earrings! Grandmothers hold a special place in our hearts. They favor more classic, timeless styles. And they’re more likely to acquire and pass down their Mother’s Day jewelry gifts as heirloom pieces. And as her collection of Mother’s Day jewelry gifts grows, she’ll need to keep it clean and stored in a safe place while she’s on the go. Offer her a jewelry cleaner and jewelry pouches to store her jewelry in! Here we are one week away from Christmas!! Our cases getting empty but luckily we have ordered and made back up jewelry just for all our last minute customers who we know will come in this week. This week leading up to Christmas will be a very busy one. But do not panic! We have the perfect gift for anyone left on your shopping list. 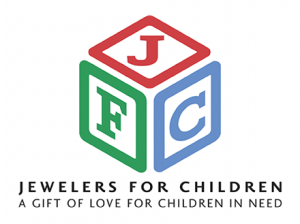 As you all know custom jewelry and engagement rings is our main focus here at Jem Jewelers but this year we have extended our inventory and began carrying beautiful giftware crafted in the United States. The items include: Jewelry boxes, Handbags, Wall & Desk Clocks, Vases, Picture Frames, Champagne Flutes & Wine Glasses and more! So this year, you can find something even for those “hard to buy for people”! We have also brought in a fabulous new diamond fashion line called Shy Creation. This high fashion jewelry line brings trendy stunning jewelry at affordable prices. Visit our “Shy Creation” page under designs to view just a small sample of our inventory. You will not be sorry!! Certain items like wine, denim, leather and cheese become finer with time. And the same goes for vintage rings, but along with time comes wear & tear. 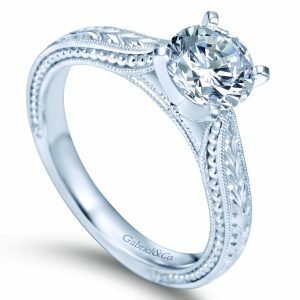 Maintaining a lovely vintage engagement ring could possibly be expensive which is one of the reasons why people prefer vintage-inspired engagement rings. 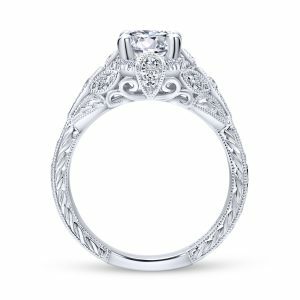 Once you learn the difference between the terms, the next step is to learn about the design details that make-up a vintage engagement ring. Below is short style guide to help you during your hunt for the ideal vintage-style engagement ring. When referring to a ring as “vintage,” it has been previously owned and is at least 20-30 years old, but normally less than 100 years old. The majority of engagement rings that are authentically vintage are usually from 1915 in the late 1960s. The same definition can be applied to “antique” ring: it has been previously owned, but was made over 100 years ago and estimated to have been produced between the mid 1800’s to about 1915. Lines are blurred between the two, but both styles are wonderful pieces of history that will stand the test of time. Any ring that is newly made, has not been previously owned, and was made to look like a vintage or antique ring is considered “vintage-inspired.” These types of rings often use antique or vintage cut diamonds such as the Old Mine Cut or Old European Cut, but have newly made settings. 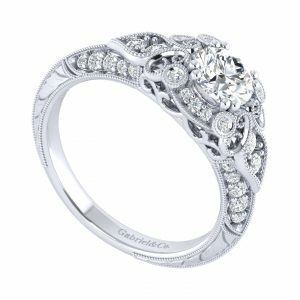 Greatly inspired by classic vintage rings, some distinguishable detailing of vintage rings is used such as milgrain detailing, a diamond halo, floral engraving and pavé diamond settings. That said, styles within vintage vary. Below is a short vintage ring style guide to help you choose the small details when making this big decision. 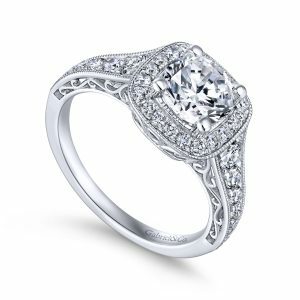 The halo style is one of the biggest trends in engagement rings since its debut in the 1920s during an era known as Art Deco. A halo ring is a setting of delicate diamonds that encircles a center gemstone in a collection of round pavé or micro-pavé diamonds to create a heavenly halo effect. This setting increases the illusion of a larger center gemstone, bringing out its beauty and sparkle. Filigree is a type of decorative metal work technique used in making jewelry. Creating light and airy features that are often associated with vintage jewelry. The filigree technique adds a flowery feminine feel that was popular in the Edwardian and Art Deco eras. As time evolved, so did the technology and technique of filigree. The design has advanced to mimic delicate lace, adding grace and femininity to any ring. The milgrain feature consists of beaded accents that add delicate detail for a more ornate, antique look. Small metal beads are applied over and over in small rows to complement filigree and to add vintage-looking texture in the piece. When used together, milgrain and filigree create a uniquely enchanting effect. Intricate patterns, letters and/or motifs are hand-cut and etched into the metal an ornate vintage feel. Knowing what “vintage” actually means and how to distinguish between the classic styles will help you purchase a ring — whether you’re looking for an engagement ring already filled with a rich history or one that will become your most treasured family heirloom for many years to come. Struggling With What To Get Dad For Father’s Day? Here are a few ideas. How about taking it up a few notches for Fathers Day this year. Give your Dad something memorable, something personal that he can cherish for many years to come and hand down through the family. Here are some really great suggestions that Jem Jewelers can assist you with. Personalized gifts such as an engraved money clip, key chain or even a modern day ID bracelet with a leather or rubber strap. Does Dad dress for work? Then choose a pair of monogrammed cufflinks or tie bar. Perhaps even a signet ring or an alternative metal ring with wooden inlay. Gold… Luxurious and precious. Wouldn’t dad look fabulous sporting a new gold bracelet or necklace? Keep in mind that personalized items are custom, so be sure to give yourself enough time to buy your dad that special gift! Father’s Day is June 18th! Mother’s Day is Sunday May 14th and like most holidays it will be here before you know it! We have been working hard creating a new look and buying new products for our store. Over the past couple of months we have been replenishing our inventory with many new affordable gift items! We are excited to announce that we will now be carrying a line of genuine Leather handbags from one of our jewelry designers, Cristina Sabatini. These handbags and clutches have a high fashion look with many different shapes, sizes, and colors. All of the handbags are from $100 on up! Now in stock- beautiful, one of a kind, handmade jewelry boxes. These jewelry boxes are made in the United States from exotic hardwoods. They make the perfect gift that most likely someone would not purchase for themselves. Jem Jewelers not only carries high end luxury jewelry, but we also carry many jewelry items under $25!!! We recently got in a large assortment of colorful glass bead stretch bracelets that are only $10!! They are available in small, medium and large beads in ANY color you can imagine! They are great for stacking with other bracelets. We are now running a promotion, Buy Three for $25! 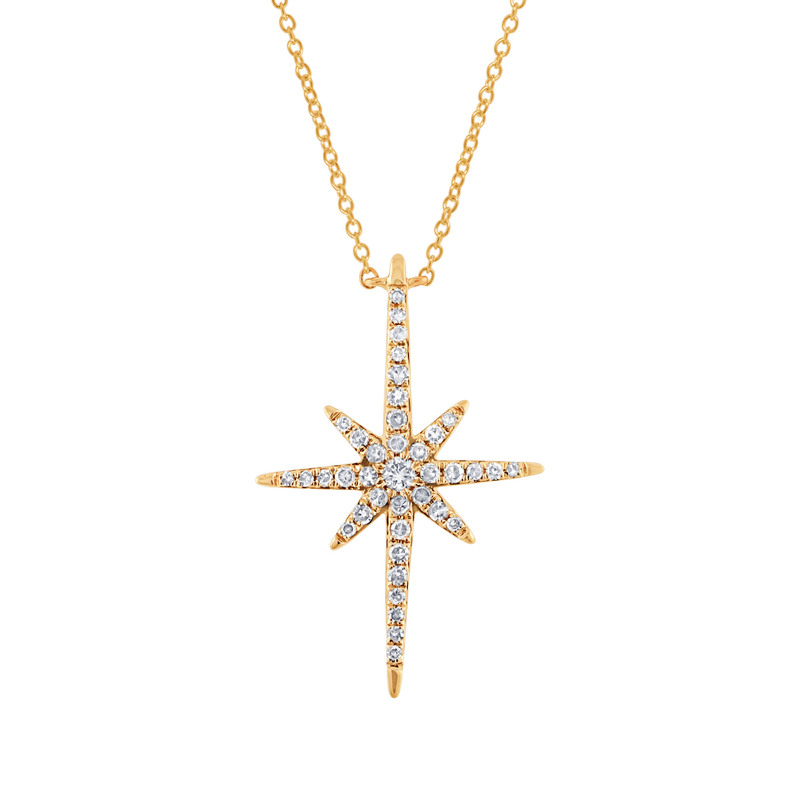 This same collection also has matching long necklaces that can be either worn as a necklace or wrapped around your wrist for a layering look. You get two looks for only $24.95!! Last but not least, we are so excited to now be carrying gorgeous stemware and gift ware. Beautifully handcrafted, made in the USA, we have an assortment of champagne flutes, wine glasses, as well as vases. More to come!! And don’t forget about our 24k Gold Dipped Roses! Instead of giving Mom a bouquet of flowers that die, give her a Rose she will have for a lifetime!! Stop in now to be one of the first to view our new special collections and for our storewide SALE – now through Mother’s Day. While white gold and platinum look the same to a consumer, they have very different properties. The first difference between white gold and platinum is the most basic, White gold and platinum are different metals. White gold starts out as gold. Gold is yellow. Platinum is naturally a white metal. White gold and platinum have their own properties that make them unique. The difference in cost is primarily due to platinum’s rarity and higher level of purity in platinum jewelry. White gold is a beautiful white metal, and we often recommend it, but any smart consumer should know some of the drawbacks of this metal as it ages. A white gold piece is not pure gold. In order to achieve white gold, yellow gold is mixed together with white metals such as silver, palladium, or nickel. Once the metals are mixed together, a white gold piece will then be “rhodium plated” to give it a whiter, shinier finish. This is what makes a white gold piece look the same as a platinum piece when they are both in new condition. It’s very important to understand, however, that over time the rhodium plating finish will wear down and the jewelry will begin to show its natural yellow color. When this happens, you’ll have to bring it in to Jem Jewelers to have it rhodium plated again. Depending on how active you are and how often you wear the piece of jewelry, this could start to happen fairly quickly. Platinum on the other hand, will age in a different way. To be considered platinum, a piece must contain 95% or more of the metal, making it one of the purest precious metals you can buy. Over time, platinum will fade in a different way. It will begin to lose its shiny finish, where it will start to look dull. Similar to white gold, a platinum piece can be brought back to life by Jem Jewelers who can restore its original condition simply by polishing it. It’s no secret that platinum has long been described as the hardest and most durable metal for jewelry. There is actually a difference in the way that platinum and gold handle surface scratches. When white gold is scratched, the gold is scratched away and is lost. Overtime, can make your rings wear thin. When Platinum is scratched, the platinum gets moved from one place on the ring to another. Platinum’s metal can be moved back in place with polishing because it is not actually losing metal like white gold. Platinum’s durability is one of its strongest assets as a precious metal. You’ll mostly find white gold jewelry offered in 14K (58.3% pure gold) or 18K versions (75% pure gold). Gold will be mixed with other metals to form an alloy that is stronger than pure gold (aka 24 karat gold). That’s why it is mixed with other metals to give it additional hardness. Platinum is a very strong and heavy metal. The wearer of a platinum piece will have to decide if they can handle a heavier metal like platinum over a lighter metal like white gold. The best way to test this out is by trying it on to see if its too heavy for you or if you don’t mind it. Platinum is the densest precious metal that you can buy, so all of these factors will have to be considered. When comparing metals, you’ll also want to think about the possibility that the metal could irritate your skin or cause an allergic reaction. Hypoallergenic metals will help to reduce the possibility that you will have an allergic reaction by minimizing potentially irritating substances. Platinum is actually the only true hypoallergenic precious jewelry metal that you can buy, because it is 95% pure. Because white gold is made from a mix of metals, some of these metals could easily irritate someone’s skin if they have a particular sensitivity. If you are aware of any of these allergies or suspect you may have any, then stick to platinum. One of the biggest selling points of white gold over platinum is cost. Platinum will almost always be more expensive than white gold because it is 30 times more rare and mined much less than gold. To be more specific, 2,700 tons of gold are mined per year compared to 80 tons of platinum. Also, platinum is denser than gold. The exact same ring would weigh more if its made of platinum over white gold. This same ring in platinum would also be much more expensive in platinum because precious metals are priced by weight. Some of these factors play a big role in the price differentiation between platinum and white gold. Depending on what you are looking for in a ring, you’ll have to weigh the cost and overall benefits of each metal to truly understand which is the better option for you. Mother’s day is celebrated on different days through out the world, but is typically observed in the U.S. the second Sunday of May. Anna Jarvis was the driving force behind the first Mother’s Day observation in 1908 with the help of Philadelphia merchant John Wanamaker. It all actually started back in the 1850’s when West Virginia Women’s Organization Ann Reeves Jarvis, Anna’s mother, held Mother’s Day Clubs to try to improve conditions to fight disease and lower infant mortality. These groups also tended to wounded soldiers from both sides during the Civil War from 1861-1865. After the war, Jarvis along with other women organized Mother’s Day Friendship Day to reunite families that had been separated during the war and also to try to unite former foes. One, Julia Ward Howe, best known as the composer of the Battle Hymn of the Republic, launched a widely read “Mother’s Day Proclamation” in 1870- asking women to take an active political role in promoting peace. Jarvis had also initiated a Mother’s Friendship Day for Union and Confederate loyalists across her state. Even though Anna never had any children of her own, she was inspired to organize the first Mother’s Day celebration in May of 1908 where many families got together in Anna’s hometown of Grafton W.V., as well as Philadelphia and several other cities. Mother’s Day came to be observed in growing numbers and was officially set as the second Sunday in May by U.S. President Woodrow Wilson in May of 1914. Mother’s, not Mothers Day was meant to celebrate the best Mother that you’ve ever known, as a son or daughter. Hence not using the plural form. Soon the idea of Mother’s Day was wide spread and turned into the giving of cards and gifts. Jarvis was unhappy with the commercialization of Mother’s Day and spent quite a bit of her own money and inheritance to try to return it to its original concept. It has been said that in 1923 she had stormed into a convention of Confectioners in Philadelphia. Two years later a similar protest followed when she crashed a fundraiser being held by the The American War Mothers selling carnations also in Philadelphia and was arrested for disturbing the peace. Modern Mother’s Day in America continues as a nationally celebrated holiday with Mom being treated to cards, flower and candy, as well as brunch and bling. It is the second most popular holiday for giving gifts. Mother’s Day globally is celebrated in various ways on various days, But more often than not is the second Sunday in May. March 21 is the day most Arabs celebrate. Panama celebrates on December 8, when the Catholic Church honors perhaps one of the most famous Mother’s, the Virgin Mary. Thailand Mother’s are honored on August 12, the birthday of Queen Sirikit who has reigned there since 1956. Britain celebrates the centuries old Mothering Sunday on the 4th Sunday of the Christian period of Lent where people visit the Mother church or main cathedral instead of their local parish. How do I care for my Pearls? Pearls are created by a living creature. They are formed when a bead or nucleus is inserted into a shellfish. A substance called “nacre” is secreted by the animal and coats the bead through time like layers in an onion. The thicker the nacre , the more beautiful the pearl’s luster will be. Being comprised of an organic substance , pearls are very sensitive to chemicals such as hairspray, perfumes and make-up. We recommend applying all of your cosmetics first, then put on your pearls. Promptly remove your pearls after you have enjoyed wearing them and store them away from any other jewelry in their own pearl folder or soft cloth. Restring your pearls when there is movement between them , or if the strand has broken. Typically pearls are strung and knotted on silk, which can wear through time. If you wear your pearls often, a once a year restringing may be a good rule of thumb. You may clean your pearls with a gentle , mild pearl cleaner that we sell in our showroom at Jem Jewelers. Here at Jem Jewelers we recommend having your fine jewelry inspected every six months. This way we can check stones, prongs, settings and clasps to make sure they are in good condition. Remember- All fine jewelry will need maintenance at some point, so remove the opportunity for any losses by stopping in to Jem Jewelers anytime for free cleaning and inspection.